In addition to the wide range of signmaking materials from 3M, for which it is the UK’s largest stockholder and distributor, together with materials from Arlon, ContraVision, iSee2 and R-Tape, William Smith has added a range of knifeless vinyl cutting systems and introduced an extensive range of tools and accessories sourced primarily from 3M and Swann Morton. As the term implies, the patented knifeless cutting systems dispense with the need for traditional knives and cutters that are capable of damaging valuable substrates if handled incorrectly and rely instead on the use of an ultra-fine filament to produce crisp and even cuts comparable to those achieved using traditional methods. Available in four formats to accommodate different sign and graphics applications, the Finish Line version is the one best suited to vehicle wrapping. Significantly, it is a 3M-certified approved tool used in 3M’s Advanced Installer Training Classes. The range of tools and accessories has been designed to assist and improve the use of self-adhesive films in their application, for their predicted life span and during their purposeful removal. 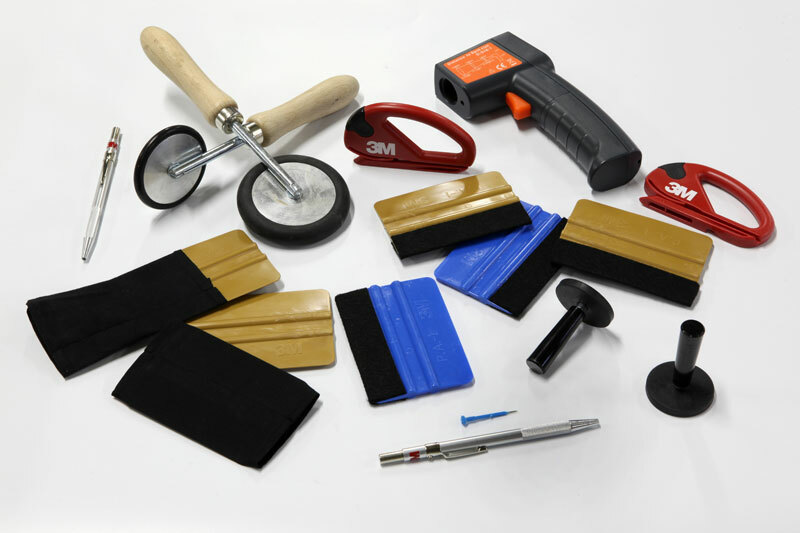 The vast range of products comprises surface application, cleaning and protection fluids, knives, blades and cutters, rollers, heat guns, squeegees, primers and edge-sealers. The range also includes a special Essential Tool Kit Bundle that is available at a particularly attractive price. Major recent product launches from William Smith are spearheaded by 3M’s Envision Print Wrap Film 480Cv3 and Gloss Wrap Over-laminate 4548G and the Envision Translucent and Diffuser Films that are reputedly the first signmaking films to optimise LED technology. 3M Envision Print Wrap Film 480Cv3 is a PVC- and Phthalate-free film developed to provide outstanding performance in a more eco-friendly solution. The film and over-laminate are highly conformable, can be applied in extreme temperature conditions, share high tensile strength for faster removal and have comprehensive ink compatibility. The 3M Envision Translucent and Diffuser Films have been described as industry breakthroughsenabling signmakers to achieve maximum brightness whilst requiring fewer light sources. As a result, maintenance, power usage and overall running costs are greatly reduced. Whilst optimised for use with LED systems, the films can also be used with conventional fluorescent lighting systems. The diffuser films are available with two levels of brightness (50 and 60 percent) to manage sign illumination more efficiently, with the translucent films available in both standard and customised colours and in an inkjet-printable format.